With several states increasing minimum wage this year manufacturers are looking for ways to offset rising labor costs that will have a trickle up effect. Workers near or at proposed minimum wages will in turn expect an increase in their wages and those above them and so on, and so on. Just as much as customers expect innovative products from manufacturers, with today’s economic pressures customers also expect companies to focus on cost-reductions rather than passing on rising costs. For manufacturers, that requires optimizing plant efficiency with increased automation. These investments in automation have created increased outputs per man-hour and lower costs per unit. Pneumatic conveying systems have the ability to reduce costs by increasing productivity, solving costly safety and hygiene problems, adding flexibility to line, eliminating product contamination and a host of other issues. Labor is among the highest costs in business and the discussion of manufacturing automation, job loss, and minimum wage has been a topic of discussion since automation first came into being. Automation in an organization experiencing rapid growth allows organizations to manage that growth in ways that meet demand without outpacing cash flow and diminishing profits. When a coffee producer experienced exponential growth material transfer was entirely manual including batching, blending and other intermediate steps. The workforce needed to move all the materials quickly grew to 40 people and still couldn’t keep up with demand. To protect profits and ensure growth didn’t kill the organization, the coffee producer installed six vacuum receivers that reduced the number of workers to 12 over three shifts. Two of the conveyors include load cells and a weight control system, functioning as weigh hoppers over two blenders. The other four vacuum receivers, installed in pairs, include a pair on each of two hoppers that feed the coffee-packaging machines. Whether it is increased demand from a market, or a start-up that has finally arrived at the point in the business plan where equipment investment is warranted to stay ahead of orders, pneumatic conveyors often enable organizations to reduce the amount of time it takes to produce a product. After several years of building a strong industry presence and global distribution channels, a specialty pool coating company planned to invest in a large-scale blender and eliminate the slow hand scooping of 160 lbs of ingredients into a drum mixer. However, the organization needed to find a way to load the 1000 lb capacity blender that was approximately 7 feet tall. Hand scooping six-160 lb barrels, five pounds at a time, took three days and there was no way safe way to get those barrels into the blender. Not only was it slow going, it was also an ergonomically flawed process that created airborne dust with each scoop. To load the blender a unique adaptation of vacuum transfer called "direct charge blender loading”, designed specifically for the direct charge loading of blenders, mixers, reactors and any vessel capable of withstanding a vacuum allowed the manufacturer to reduce what used to take 3 days to weigh out, blend, get packaged and on the shelves to a single day. The non-standard dual-purpose system that uses the same conveyor system to load and unload the blender tripled throughput. Reducing man-hours and increasing production speed are not the only ways that automating a process with pneumatic conveyors produces cost benefits. Pneumatic conveyors also increase system reliability, adding hours of production to the schedule. With 24/7 plant operation, manufacturers need constant throughput. On a production schedule that tight, any downtime immediately impacts revenue. Traditional conveying equipment, however, such as bucket elevators, aren’t able to easily re-route product when other machinery malfunctions—often with a bucket elevators, malfunctions cause production shut down for a minimum of 30 minutes. Essential to plant efficiency is the ability for conveying equipment used in production to properly coordinate with packaging equipment. Ultimately, when a packaging machine goes off-line, product should be re-routable to operating machines. As well, the conveying equipment should adjust speed when packaging machines fill bags of different sizes. With pneumatic conveyors, if a packaging machine malfunctions, product easily diverts, at the touch of a button, to other machines. By eliminating many of the production/packaging bottlenecks of bucket elevator systems, pneumatic conveyors add about 8 hours a week to production. For a snack food manufacturer, replacing bucket elevators with pneumatic conveyors eliminated the need to do monthly preventive maintenance on 20 or so moving parts for its bucket-elevator type systems. With the pneumatic conveyor, the food manufacturer now just cleans or swaps out hoses, and checks the motor and oil twice a year, adding nearly 30 hours of production a year. As opposed to open-air conveyors that contribute to respiratory hazards, often necessitating operators wear dust masks (which increases costs), and require strict safety measures while cleaning due to their many moving parts, fully enclosed pneumatic conveyors, with virtually no moving parts, contribute to plant and personnel safety. Since the inherent nature of the pneumatic system prevents loose powder from becoming airborne, it makes for a cleaner and safer environment all around, and a greater number of organizations are looking at safety reasons for engaging a pneumatic conveying systems. In the goods producing industry, which accounts for account for 35 percent of all occupational illness and injury cases, “manual materials handling is the principal source of compensable injuries,” according to OSHA. When practical, designing the hazard out of the process through engineering is the best practice for reducing them. While 4 out of 5 manual materials handling injuries affect the back (lifting, repetitive motion, slips and falls) when manually transporting bulk dry materials, additional safety hazards such as poor respiratory environment and fugitive dust problems are effectively eliminated with pneumatic conveying systems. Any time a pneumatic conveying system is employed, costs associated with housekeeping diminish, as well as the potential for a dust explosion. The right system means the elimination of labor-intensive cleanup of floors, surfaces and unnecessary cleaning of machinery. In addition to creating a safer environment that requires less cleaning because of its enclosed nature, the ability to reclaim or recycle material is another way that manufacturers save money with enclosed vacuum systems. In many industries product reclamation is an important aspect in reducing costs whether reclaiming a product to reuse in the process or separating products for waste reduction. 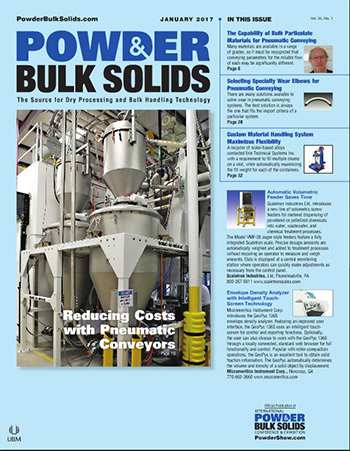 From fine powdery substances to larger particles, pneumatic experts know how to achieve minimal waste. In the baking and snack industry distribution screws for dry material dispensing machines eliminate waste or lost material from operations such as sesame-seed and corn meal topping machines and spreaders. Routinely, hoppers that deliver product to dispensing machines via a pneumatic conveying system are located directly above the topping machines resulting in dry materials congregating in the center of topping machines, requiring an operator to periodically spread the material in the topping machine by hand to ensure evenly distributed product. The distribution screw for dry material dispensing machines features a long extension tube with adjustable slots that attaches to the pneumatic conveying system, facilitating even distribution of the material across the dispensing machine, eliminating the need for operators to monitor machines, and delivering the unused product back into the system. Sometimes reclaiming product is not about delivering it back into a system but separating it out for a completely different use. An animal laboratory reduced its regular waste stream by approximately 75 percent when it utilized a pneumatic system to separate out organic corn meal material used for bedding. Not only did the system save about 10-hours a week of labor, it also allowed the waste material to be converted into a product that is reused as fertilizer. As companies move through an uncertain economy into the 21st century, only those with the most efficient, flexible and cost-effective operations will survive. Pneumatic conveying systems bring these elements into production lines affordably and effectively. Founded in 1954, VAC-U-MAX has been at the forefront of leading edge conveying systems and components across a wide range of industries including food, pharmaceutical, chemical and industrial markets. To learn more about how VAC-U-MAX pneumatic conveying systems and mechanical conveying solutions such as screw conveyors, flexible screw conveyors, aero-mechanical conveyors, and belt conveyors can improve efficiency, ergonomics, preserve product integrity, or reduce costs, write to them at 69 William Street, Belleville, NJ 07109; call 1-800-VAC-U-MAX (800) 822-8629 or (973) 759-4600; e-mail info@vac-u-max.com; or visit their website www.vac-u-max.com.